No more sluggish inbox load times. No more files that can only be opened by specific programs. Gone are the restrictions on saving and sharing. 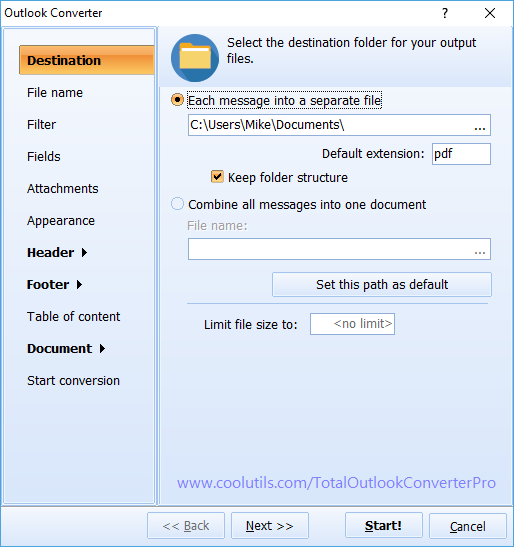 With the help of our Total Outlook Converter Pro users can convert Outlook emails to TIFF with attachments in just a few quick clicks. Whether you prefer working through the command line, or our award-winning GUI we have exactly what you need to get the job done. 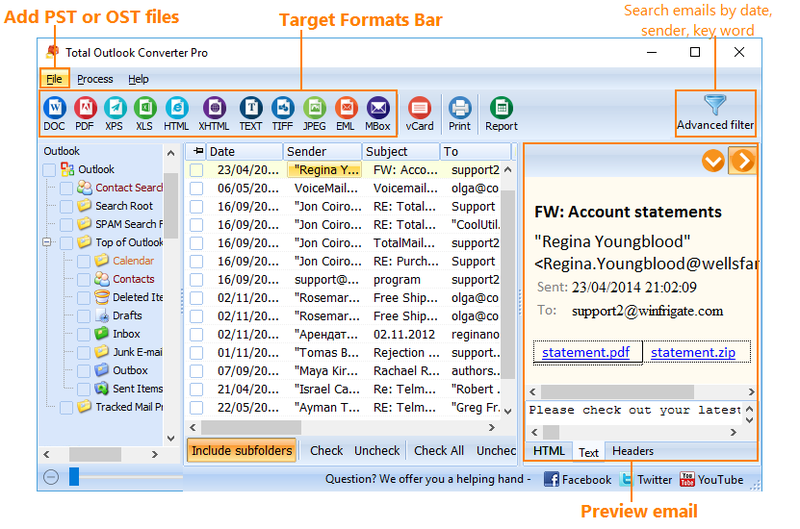 With the Outlook Converter Pro you can convert Outlook emails to the TIFF format allowing you to save Outlook emails as images. When you save Outlook emails as TIFF you not only increase their accessibility, but you enhance their portability as well. That's because there are more programs and devices able to work with TIFF than Outlook's native .PST format. Best of all, unlike other converters out there, ours allows you to work with attachments too! Of course, we also take pride in knowing that no other converter software provides its users with so many options. We don't simply convert formats; we help you make your target documents even better than the originals. 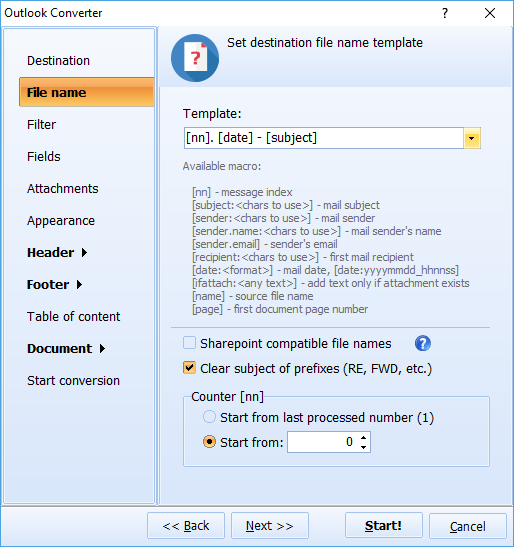 Choose to convert or maintain attachment formats. Export only selected fields (sender IP, subject, body etc). Determine appearance with a custom CSS files. Include custom headers/footers (page numbers, dates, company name). Define layout and page size. Give converted file new descriptive names. Select any font available on your hard drive. For 13 years we've developed the best in conversion software around the world. With a presence in North America, Europe and Asia we specialize in designing solutions that help everyone to communicate better. Whenever a new format is released, we begin developing a way to convert that format to something familiar; more accessible. Don't take our word for it though, download our free trial version and give us a try today! 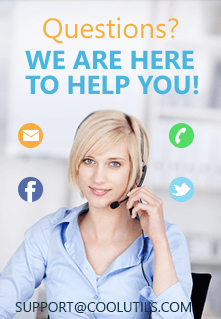 For a modest fee of just $99.90 you will gain access to our awesome support staff and a lifetime license to our product. No subscriptions necessary. No hidden costs ever. Check us out and join the fun. If you discover anything missing, or have a suggestion on how we might improve our converter(s) let us know! We often add in new features based on our users' feedback.